The founder of the Turkish Republic and its first President, stands as a towering figure of the 20th Century. Among the great leaders of history, few have achieved so much in so short period, transformed the life of a nation as decisively, and given such profound inspiration to the world at large. Emerging as a military hero at the Dardanelles in 1915, he became the charismatic leader of the Turkish national liberation struggle in 1919. He blazed across the world scene in the early 1920s as a triumphant commander who crushed the invaders of his country. Following a series of impressive victories against all odds, he led his nation to full independence. He put an end to the antiquated Ottoman dynasty whose tale had lasted more than six centuries – and created the Republic of Turkey in 1923, establishing a new government truly representative of the nation’s will. As President for 15 years, until his death in 1938, Mustafa Kemal Atatürk introduced a broad range of swift and sweeping reforms – in the political, social, legal, economic, and cultural spheres – virtually unparalleled in any other country. His achievements in Turkey are an enduring monument to Atatürk. Emerging nations admire him as a pioneer of national liberation. The world honors his memory as a foremost peacemaker who upheld the principles of humanism and the vision of a united humanity. Tributes have been offered to him through the decades by such world statesmen as lloyd George, Churchill, Roosevelt, Nehru, de Gaulle, Adenauer, Bourguiba, Nasser, Kennedy, and countless others. A White House statement, issued on the occasion of “The Atatürk Centennial” in 1981, pays homage to him as “a great leader in times of war and peace”. It is fitting that there should be high praise for Atatürk, an extraordinary leader of modern times, who said in 1933: “I look to the world with an open heart full of pure feelings and friendship”. Atatürk stands as one of the world’s few historic figures who dedicated their lives totally to their nations. He was born in 1881 (probably in the spring) in Salonica, then an Ottoman city, now in Greece. His father Ali Riza, a customs official turned lumber merchant, died when Mustafa was still a boy. His mother Zubeyde, a devout and strong-willed woman, raised him and his sister. First enrolled in a traditional religious school, he soon switched to a modern school. In 1893, he entered a military high school where his mathematics teacher gave him the second name Kemal (meaning perfection) in recognition of young Mustafa’s superior achievement. He was thereafter known as Mustafa Kemal. In 1905, Mustafa Kemal graduated from the War Academy in Istanbul with the rank of Staff Captain. Posted in Damascus, he started with several colleagues, a clandestine society called “Homeland and Freedom” to fight against the Sultan’s despotism. In 1908 he helped the group of officers who toppled the Sultan. Mustafa Kemal’s career flourished as he won his heroism in the far corners of the Ottoman Empire, including Albania and Tripoli. He also briefly served as a staff officer in Salonica and Istanbul and as a military attache in Sofia. In 1915, when Dardanelles campaign was launched, Colonel Mustafa Kemal became a national hero by winning successive victories and finally repelling the invaders. Promoted to general in 1916, at age 35, he liberated two major provinces in eastern Turkey that year. In the next two years, he served as commander of several Ottoman armies in Palestine, Aleppo, and elsewhere, achieving another major victory by stopping the enemy advance at Aleppo. On May 19, 1919, Mustafa Kemal Pasha landed in the Black Sea port of Samsun to start the War of Independence. In defiance of the Sultan’s government, he rallied a liberation army in Anatolia and convened the Congress of Erzurum and Sivas which established the basis for the new national effort under his leadership. On April 23, 1920, the Grand National Assembly was inaugurated. Mustafa Kemal Pasha was elected to its Presidency. Fighting on many fronts, he led his forces to victory against rebels and invading armies. Following the Turkish triumph at the two major battles at Inonu in Western Turkey, the Grand National Assembly conferred on Mustafa Kemal Pasha the title of Commander-in-Chief with the rank of Marshal. At the end of August 1922, the Turkish armies won their ultimate victory. Within a few weeks, the Turkish mainland was completely liberated, the armistice signed, and the rule of the Ottoman dynasty abolished. In July 1923, the national government signed the Lausanne Treaty with Great Britain, France, Greece, Italy, and others. In mid-October, Ankara became the capital of the new Turkish State. On October 29, the Republic was proclaimed and Mustafa Kemal Pasha was unanimously elected President of the Republic. Atatürk married Latife Usakligil in early 1923. The marriage ended in divorce in 1925. The account of Atatürk’s fifteen year Presidency is a saga of dramatic modernization. With indefatigable determination, he created a new political and legal system, abolished the Caliphate and made both government and education secular, gave equal rights to women, changed the alphabet and the attire, and advanced the arts and the sciences, agriculture and industry. In 1934, when the surname law was adopted, the national parliament gave him the name “Atatürk” (Father of the Turks). On November 10, 1938, following an illness of a few months, the national liberator and the Father of modern Turkey died. But his legacy to his people and to the world endures. Mustafa Kemal Pasha emerged as the national liberator of the Turks when the Ottoman Empire, carved up by the Western Powers, was in its death throes. Already a legendary hero of the Dardanelles and other fronts, he became in 1919 the leader of the Turkish emancipation. With a small and ill-equipped army, he repelled the invading enemy forces on the East, on the South, and on the West. He even had to contend with the Sultan’s troops and local bands of rebels before he could gain complete control of the Turkish homeland. By September 1922, he had received one of history’s most difficult triumphs against internal opposition and powerful external enemies. The liberator ranks among the world’s greatest strategists and holds the rare distinction of having maintained a perfect military record consisting of only victories and no defeats. Turkish nation holds Atatürk in gratitude and reverence for his military victories and his cultural and socio-political reforms, which gave Turkey its new life and place in the world agfter the First World War. October 29, 1923 is a fateful date in Turkish history. On that date. Mustafa Kemal Pasha, the liberator of his country, proclaimed the Republic of Turkey. The new homogeneous nation-state stood in sharp contrast to the multi-ethnic Ottoman Empire out of whose ashes it arose. The dynasty and theocratic Ottoman system, with its Sultanate and Caliphate, thus came to and end. Atatürk’s Turkey dedicated itself to the sovereignty of the national will – to the creation of, in President’s words, “the state of the people “. The Republic swiftly moved to put an end to the so-called “Capitulations “, the special rights and previledges that the Ottomans had granted to some European powers. The New Turkey’s ideology was, and remains, “Kemalism”, later known as “Atatürkism”. Its basic principles stress the republican form of government representing the power of electorate, secular administration, nationalism, mixed economy with state participation in many of the vital sectors, and modernization. Atatürkism introduced to Turkey the process of parliamentary and participatory democracy. The first Moslem nation to become a Republic, Turkey has served since the early 1920s as a model for Moslem and non-Moslem nations in the emerging world. Among the far-reaching changes were the new Civil Code, Penal Code, and Business Law, based on the Swiss, Italian and German models respectively. The new legal system made all citizens – men and women, rich and poor – equal before the law. It gave Turkey a firm foundation for a society of justice and equal rights. Atatürk’s aim was to modernize Turkish life in order to give his nation a new sense of dignity, equality, and happiness. After more than three centuries of high achievement, the Ottoman Empire had declined from the 17th to the early 20th Century: With Sultans presiding over a social and economic system mired in backwardness, the Ottoman state had become hopelessly outmoded for the modern times. Atatürk resolved to lead his country out of the crumbling past into a brave new future. In his program of modernization, secular government and education played a major role. Making religious faith a matter of individual conscience, he created a truly secular system in Turkey, where the vast Moslem majority and the small Christian and Jewish minorities are free to practice their faith. As a result of Atatürk’s reforms, Turkey -unlike scores of other countries- has fully secular institutions. To give his nation a modern outlook, Atatürk introduced many reforms: European hats replaced the fez; women stopped wearing the veil; all citizens took surnames; and the Islamic calendar gave way to the Western calendar. A vast transformation took place in the urban and rural life. It can be said that few nations have ever experienced anything comparable to the social change in Atatürk’s Turkey. When the Turkish Republic came into being in 1923, it lacked capital, industry, and know-how. Successive wars had decimated manpower, agricultural production stood at a low level, and the huge foreign debts of the defunct Ottoman state confronted the new Republic. With determination and vigor, Atatürk’s Turkey undertook agricultural expansion, industrial growth, and technological advancement. In mining, transportation, manufacturing, banking, exports, social services, housing, communications, energy, mechanization, and other vital areas, many strides were taken. Within the decade, the gross national product increased five-fold. Turkey’s economic development during Atatürk’s Presidency was impressive in absolute figures and in comparison to other countries. The synthesis that evolved at that time -state enterprises and private initiative active in both industrial and agricultural growth- serves as the basis of the economic structure not only for Turkey but also in dozen countries. As the 1920s came to an end, Turkey had fully and functionally adopted, with its 29 letters (8 vowels and 21 consonants), has none of the complexities of the Arabic script, which was ill-suited to the Turkish language. The language reform enabled children and adults to read and write within a few months, and to study Western languages with greater effectiveness. Thousands of words, and some grammatical devices, from the Arabic and Persian, held a tight grip over Ottoman Turkish. In the early 1930s, Atatürk spearheaded the movement to eliminate these borrowings. To replace the loan words from foreign languages, large number of original words, which had been in use in the earlier centuries, where revived, and provincial expressions and new coinages were introduced. The transformation met with unparalleled success: In the 1920s, the written language consisted of more than 80 percent Arabic, Persian, and French words; by the early 1980s the ratio had declined to a mere 10 percent. Atatürk’s language reform -encompassing the script, grammar and vocabulary- stands as one of the most far-reaching in history. It has overhauled Turkish culture and education. With abiding faith in the vital importance of women in society, Atatürk launched many reforms to give Turkish women equal rights and opportunities. The new Civil Code, adopted in 1926, abolished polygamy and recognized the equal rights of women in divorce, custody, and inheritance. The entire educational system from the grade school to the university became coeducational. Atatürk greatly admired the support that the national liberation struggle received from women and praised their many contributions: ” In Turkish society, women have not lagged behind men in science, scholarship, and culture. Perhaps they have even gone further ahead.” He gave women the same opportunities as men, including full political rights. In the mid-1930s, 18 women, among them a villager, were elected to the national parliament. Later, Turkey had the world’s first women supreme court justice. Atatürk regarded education as the force that would galvanize the nation into social and economic development. For this reason, he once said that, after the War of Independence, he would have liked to serve as Minister of Education. As President of the Republic, he spared no effort to stimulate and expand education at all levels and for all segments of the society. Turkey initiated a most ambitious program of schooling children and adults. From grade school to graduate school, education was made free, secular, and co-educational. Primary education was declared compulsory. The armed forces implemented an extensive program of literacy. Atatürk heralded “The Army of Enlightenment”. With pencil or chalk in hand, he personally instructed children and adults in schoolrooms, parks, and other places. Literacy which had been less than 9 percent in 1923 rose to more than 33 percent by 1938. To give impetus to science and scholarship, Atatürk transformed the University of Istanbul (founded in the mid-15th century) into a modern university in 1933. A few years later, the University of Ankara became into being. Today, Turkey has major universities all over the country. Except for Europe and North America she has one of the world’s highest ratios of university graduates to population. 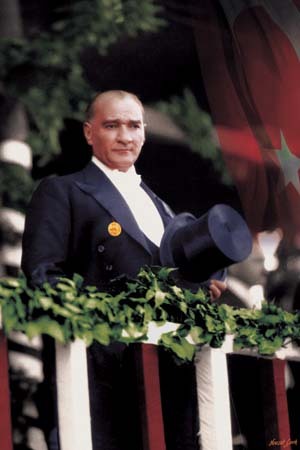 To creat the best synthesis, Atatürk underlined the need for the utilization of all the viable elements in the national heritage, including the ancient indigenous cultures, and the arts and techniques of the entire world civilization, past and present. He gave impetus to the study of the earlier civilizations of Anatolia – including Hittite, Phrygian, Lydian, and others. Pre-islamic culture of the Turks became the subject of extensive research which proved that, long before their Seljuk and Ottoman Empires, the Turks had already created a civilization of their own. Atatürk also stressed the folk arts of the countryside as the wellspring of Turkish creativity. The visual and plastic arts (whose development had been arrested by some bigoted Ottoman officials who claimed that the depiction of the human form was idolatry) flourished during Atatürk’s Presidency. Many museums were opened. Architecture gained new vigor. Classical Western music, opera and ballet as well as the theater took impressive strides. Several hundred “People’s Houses” and the ” People’s Rooms” all over Turkey gave local people and youngsters a wide variety of artistic activities, sports, and other cultural affairs. Book and magazine publication enjoyed a boom. Film industry started to grow. In all walks of cultural life, Atatürk’s inspiration created an upsurge. Atatürk’s Turkey is living proof of this ideal – a country rich in its own national culture, open to the heritage of world civilization, and at home in the endowments of the modern technological age. A military hero who had won victory after victory against many foreign invaders, Atatürk knew the value of peace and, during his Presidency, did his utmost to secure and strengthen it throughout the world. Few of the giants of the modern times have spoken with Atatürk’s eloquence on the vital need to create a world order based on peace, on the dignity of all human beings, and on the constructive interdependence of all nations. He stated, immediately after the Turkish War of Independence, that “peace is the most effective way for nations to attain prosperity and happiness.” Later as he concluded treaties of friendship and created regional ententes, he affirmed: ” Turks are the friends of all civilized nations.” The new Turkey established cordial relations with all countries, including those powers which had tried a few years earlier to wipe the Turks off the map. She did not pursue a policy of expansionism, and never engaged in any act contrary to peaceful co-existence. Atatürk signed pacts with Greece, Rumania and Yugoslavia in the Balkans, and with Iran, Iraq and Afghanistan in the East. He maintained friendly relations with the Soviet Union, the United States, England, Germany, Italy, France, and all other states. In the early 1930s, he and the Greek Premier Venizelos initiated and signed a treaty of peace and cooperation.